If you want to use a slider at the top of your homepage (or any page), there is a very simple way to do this. Once you have installed your preferred slider plugin and have created your slider, find the shortcode it gives you to output the slider. Note: Listify does not control *any* aspect of the slider plugin you are using. If something is not working properly please contact the author of the plugin you are using. First, create a new page in WordPress. 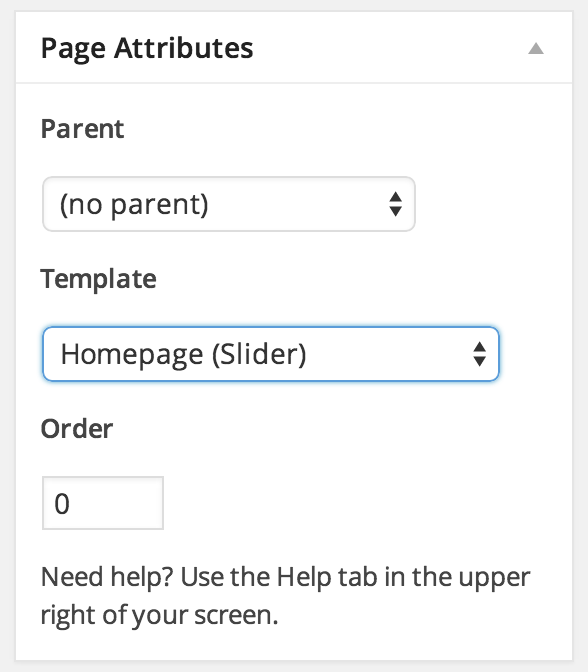 Then on the right hand side in "Page Attributes" assign the "Homepage (Slider)" page template. Once you have done this, paste the shortcode of the slider in to the page content area. When your page is published you can visit "Widgets > Appearance" on the left side of the WordPress admin. When viewing the widget areas you will see a new area for your newly created page. You can add any of the "Listify - Page" widgets to this area.